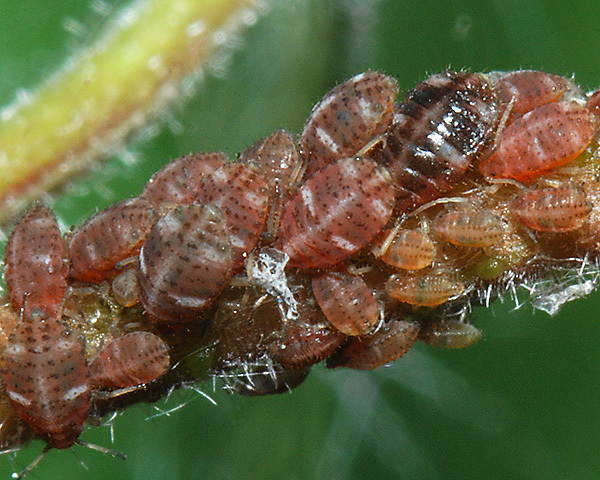 Glyphina are rather small aphids (body length about 2 mm). The dorsum is pigmented usually greenish or blackish with many conspicuous hairs. The antennae are very short. The siphunculi are present as pores on small cones. There are 5 species which feed on alder (Alnus) or birch (Betula). The 3 Palaearctic species feed on aerial shoots, whereas the two North American species apparently feed underground. They have a sexual stage in the life cycle, but do not host alternate. Glyphina are usually attended by ants. 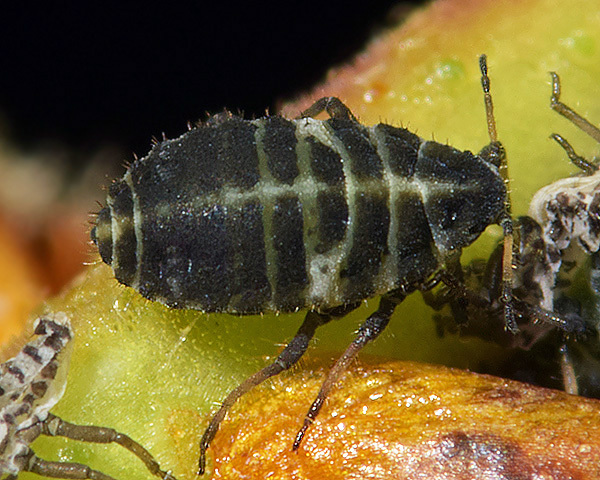 Glyphina betulae alatae (see second picture above) are dark green, with a dark brown to blackish head and thorax. The immature stages are green. The abdomen bears numerous tubercles and the siphunculi are short and truncated. 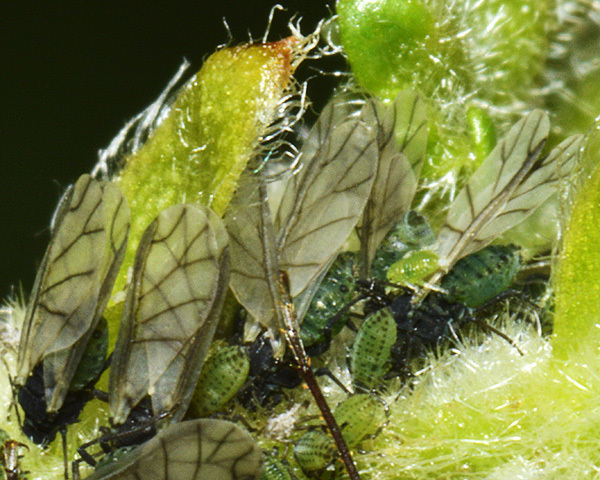 The green birch thelaxid does not host alternate but lives in colonies on young shoots of birch (Betula spp. ), especially silver birch (Betula pendula). 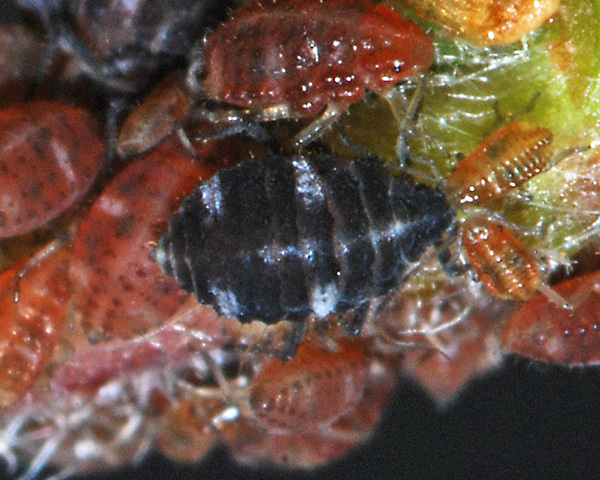 Glyphina betulae may occasionally also be found on alder (Alnus spp.). Winged forms are found from mid-June to late July. They are usually ant-attended. The life cycle is shortened with oviparae appearing in July, and apterous males in August. Glyphina betulae is found throughout Europe, and across Asia to Japan. It has been introduced to North America where it is now widespread. The brown birch thelaxid does not host alternate, but lives in colonies on the young shoots of downy birch (Betula pubescens) and related downy birches. It tends to prefer young trees and is usually attended by ants. The life cycle is shortened with sexual forms occurring in July, and eggs laid in August. Glyphina pseudoschrankiana occurs in north-west Europe and Japan.